I do love asparagus, but this dressing is delicious with steamed kale or rapini too. Prepare a big bowl of ice water to drop the cooked asparagus into..just as you take it off the boil. Plunge the asparagus in boiling water for 1-2 minutes. It should be cooked to crisp/tender, no more. Then drop it into an ice water bath to "shock" it and stop the cooking so it doesn't overcook. 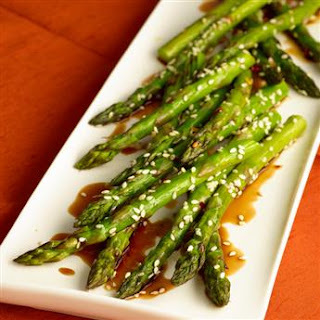 Toss the asparagus and some of the dressing together in a pretty dish and top with toasted sesame seeds.